Ten years after its arrival on PlayStation, Tekken, the daddy of all fighting games, arrives on PlayStation Portable (PSP) later this year - giving you the ability to do battle wherever and whenever you are. 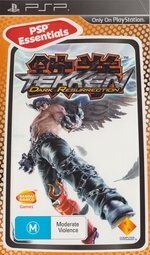 Tekken Dark Resurrection brings to PSP more than 30 customisable characters including new arrivals Dragunov and Lili, favourites from the arcade version and the long awaited return of Armor King. Not only will you have all the characters in the palm of your hand but also a great choice of game modes including Time Attack, Gold Rush and Dojo - and the option for multiplayer mayhem in Ad Hoc Wireless Mode.